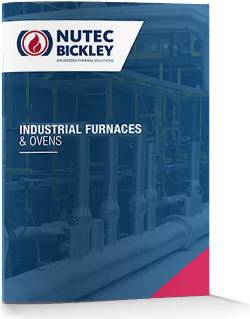 Nutec Bickley provides a Heavy duty slot furnaces fabrication in custom designs to match customer production and process requirements. Heavy duty stable steel frame and refractory construction. Use of high velocity burners to provide chamber uniform heating and radiation to parts. Fiber lined sections using the patented “jointless system” with special design to compensate the fiber shrinkage reducing the maintenance considerably. Adjustable door system in order to reduce the slot opening for optimal height and to reduce as possible the radiation heat losses. We invite you to meet our wide variety of Metal Furnace with the best equipment to all Industries.